Lovely vegan dinner at friends. Inspiration for a vegan festive menu! 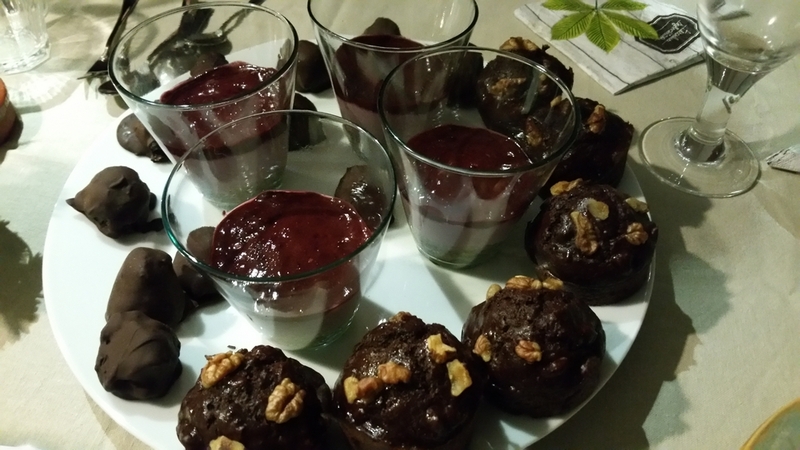 A couple of weeks ago, we were invited for dinner at the house of vegan friends. We had such a lovely evening, and the food was great! So I thought I’d share the vegan menu we were served. 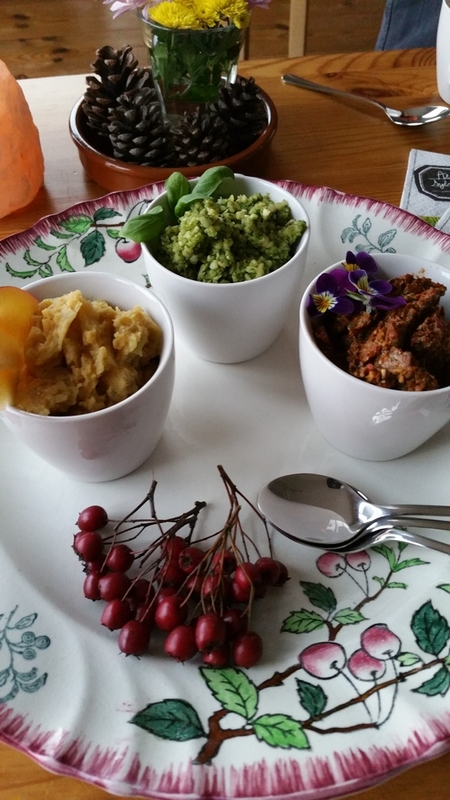 If you are still looking for inspiration for a vegan festive menu for the coming holidays, take a look at this! For appetizers we had a trio of spreads with crackers: cashew-rucola spread, tapenade of sundried tomatos and basil and lentils apple spread. What followed was a little glass with a salad of quinoa, mango, avocado and cilantro (unfortunately I forgot to take a photo of this!). 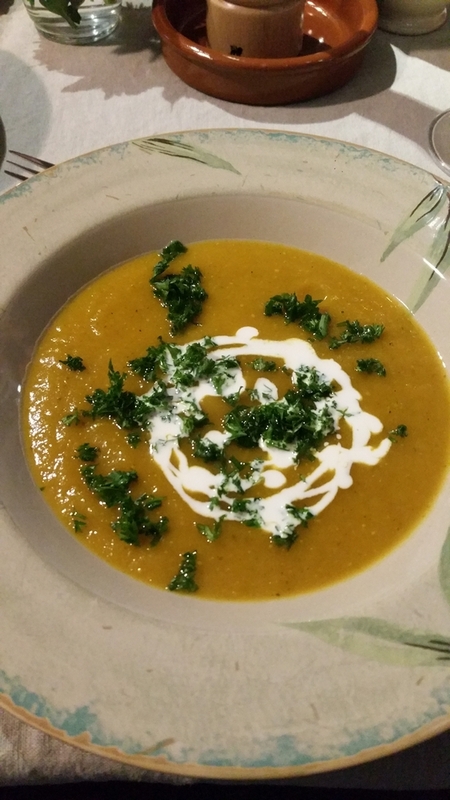 Then came leek and pumpkin cream soup. The starter was homemade (!) 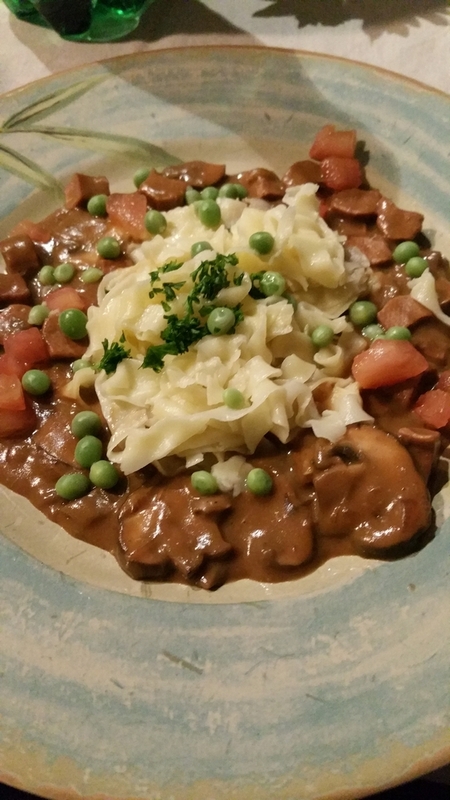 tagliatelle with forest mushrooms, peas and pieces of ‘bacon’, with a creamy sauce based on demi-glace and brandy. 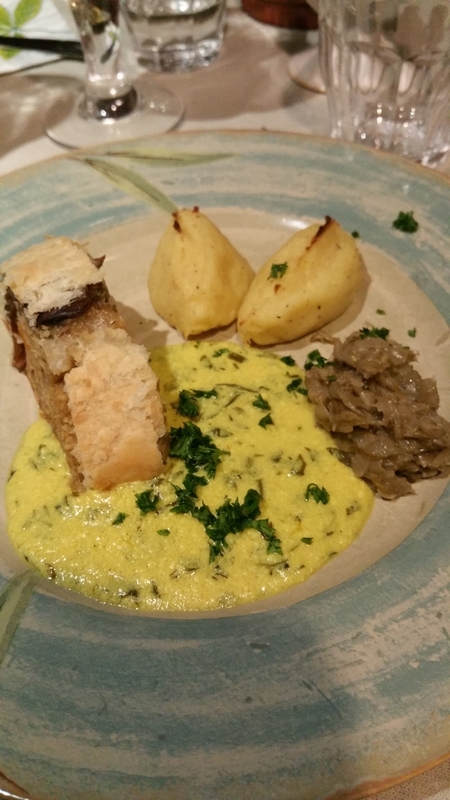 The main dish was a ‘beef wellington’ with tree variations of mushrooms and cashews, with béarnaise sauce. And mash of potatos and parsnip, and caramelised chicory and lentils on the side. Wow! 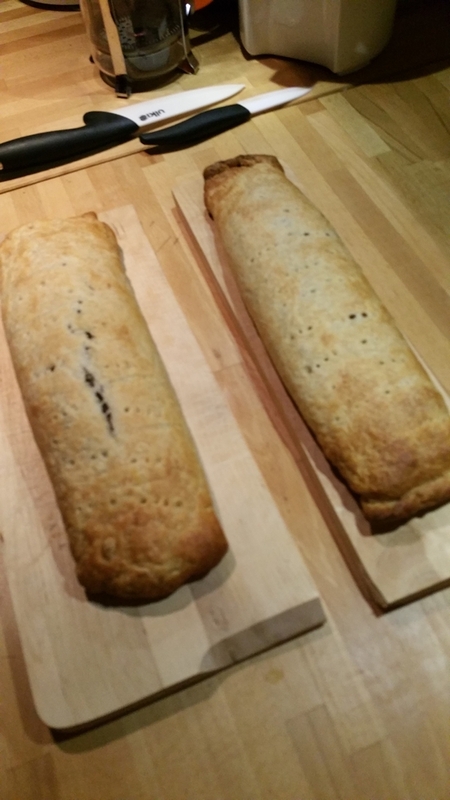 We loved the idea of veganising a traditional recipe like ‘beef wellington’ and we had not eaten béarnaise sauce in ages. That was great! How lucky you are to have vegan friends! congratulaions. Here it is ME who has to invite and to do the cooking, especially now in the festive season. Thank you for all your good reviews. On the 27 Dec. I will try your recommendation ‘Réliva’. Happy Christmas! We also have non-vegan friends who like to make us vegan dinner (and we also really appreciate that 🙂 Hope one day your friends return the favour and cook dinner for you! Thank you for your comment Elisabeth. It’s nice to know our efforts on the blog are appreciated and people find them useful 🙂 Enjoy Réliva, and your stay in Bruges! These dishes look familiar to me 😉 nice blog post! What an amazing spread – I’d be delighted to have that laid out in front of me, particularly that dessert plate! Wow, what a meal! Happy Holidays!